The Most Noble Order of the Garter was founded by King Edward III in 1348 and was the highest honor obtainable. Edward III inaugurated the Order of the Garter with a great feast and joust. The Order had a 24-man limit. As members died, were removed or beheaded, they made way for new members. The Sovereign alone could choose the inductees but members would nominate the possible replacements. Thomas Seymour was popular with members of court – there is no question about that. It has often been said that people liked him better than his older brother Edward, Earl of Hertford. This article is to show his popularity by the number of times he was nominated for the Order of the Garter and to understand how politics would often determine a man’s choice. Edward, Earl of Hertford, Thomas’ older brother (and favorite of the King) had been inducted into this prestigious group of men in 1541 – the same year as Henry Howard, Earl of Surrey, Sir John Gage and Anthony Wingfield. Eventually, in 1547, Thomas Seymour was admitted into the elusive club. It is believed that King Henry VIII (on his death bed) said Thomas should be admitted but it wasn’t until after his death that it happened. Is it possible that this was one of those “facts” that was fabricated by men like Hertford and Paget? Sure that’s possible, as it appears that they may have taken liberties when Henry could no longer acknowledge the use of his signature stamp, but it is also possible that Henry understood it was important to give this honor to the uncle of the next king. We will never know for certain – but I believe he deserved the title. It is noted in Letters and Papers from December 1543 that Thomas Seymour was nominated by several Order of the Garter members to fill the vacancy left by Thomas Manners, Earl of Rutland who passed away in September. This meeting was held at Hampton Court Palace on Christmas Ever. Earl of Essex :P. : Dorset, Shrewsbury, Derby. B. : Delaware, Cobham, Matrevers. K. : Wallop, Sir Thos. Semer, Sir Hen. Knevett. Viscount Lisle :P. : Dorset, Derby, Worcester. B. : Matrevers, Delaware, Parre. K. : Wallop, Semer, Sir Fras. Bryan. Earl of Surrrey :P. : Dorset, Shrewsbury, Derby. B. : Matrevers, Cobham, Parre. K. : Wallop, Bryan, Semer. Duke of Norfolk : P. : Dorset, Shrewsbury, Derby. B. : Delaware, Cobham, Parre. K. : Wallop, Bryan, Semer. The schedule of the nominations being brought to the King, Sir John Wallop was made a member of the Order, to the joy of all present. Every member had nominated Sir John Wallop and he was then voted in by the King. 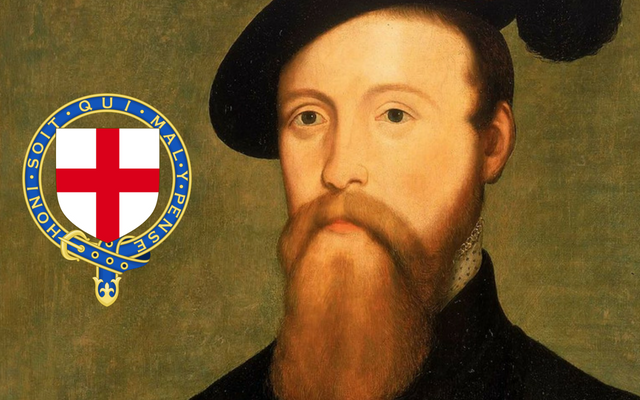 In April 1544, Sir Thomas Seymour was nominated for the Order of Garter. King Henry had already married Seymour’s love Kateryn Parr and Thomas had accepted diplomatic missions on behalf of the King which left him often out of the country. As we know, being away from the King often left you out of his immediate favor – out of sight, out of mind sort of deal. As stated previously, Thomas had to be nominated by a member of the Order of the Garter. Each member could nominate nine candidates. Three had to have the rank of earl or higher, three the rank of baron or higher, and three the rank of knight or higher. The King would choose as many nominees as were necessary to fill any vacancies in the Order. The King was also not required to choose those who received the most nominations – he could fill the posts as he pleased. Thomas was nominated along with friend Sir Francis Bryan (both were knights) and seven other men by Henry Howard, Earl of Surrey. I’ll be honest, it surprises me a bit that the Earl of Surrey would nominate Thomas since he saw the Seymour family as “upstarts” without noble birth. This, I believe, says something about Thomas – he was liked by Surrey enough to be nominated and the two (in my opinion) were kindred spirits. Earl of Essex:—Princes and barons: as Wingfield. Knights: Sir Thos. Seamoure, Sir Hen. Knevet and Selenger. Earl of Surrey:—Princes: as Wingfield. Barons: Parre of Horton, Wharton and Grey of Wilton. Knights: Sir Thomas Seymoure, Sir Hen. Knevet and Sir Fras. Bryan. Sir John Wallop was inducted into the Order in 1544. In April of 1545, nominations were taken at St. James Palace from the dukes of Norfolk and Suffolk, earls of Surrey, Essex, Hertford and Arundel, lord Russell, Viscount Lisle, lord St. John, Sir Ant. Browne, Sir John Gage and Sir Ant. Wingfield. Lord Russell:—Princes: as Wingfield. Barons: Poynyngs, Cobham, Wriothesley. Knights: Strangways, Brian, Semer. Earl of Arundel:—Princes: as Lord St. John. Barons: Wriothesley, Poynyngs, Parre. Knights: Sir Wm. Paget, Sir Thos. Semer, Sir Wm. Herbert. Earl of Hertford:—Princes: as Lord St. John. Barons: Wriothesley, Cobham, Poynyngs. Knights: Sir Hen. Knyvet, Sir Thos. Darcy, Sir Thos. Semer. Earl of Essex:—Princes: as Lord St. John. Barons: Wriothesley, Par of Horton, Poynyngs. Knights: Semer, Herbert, Bryan. Earl of Surrey:—Princes: as Wingfield. Barons: Wriothesley, Poynyngs, Delaware. Knights: Bryan, Semer, Knyvet. Duke of Suffolk:—Princes: as Wingfield. Barons: Wriothesley, Delaware, Poynyngs. Knights: Semer, Darcy, Bryan. Duke of Norfolk:—Princes: as Wingfield. Barons: as Suffolk. Knights: Semer, Bryan, Knyvet. The King having read over the names, Shrewsbury and Wriothesley were chosen. In August of 1545 the Duke of Suffolk died leaving a vacancy in the Order – it appears that the spot was not filled until May of 1546. Once again, Thomas Seymour was nominated. Lord Wriothesley:—Princes: Marquis Dorset, earl of Cumberland and earl of Sussex. Barons: lords Cobham, Par of Horton and Wharton. Knights: Sir Wm. Paget, Sir Thos. Seymer, and Sir Wm. Herbert. [Sir Anthony] St. Leger:—Princes: Dorset, Worcester, Sussex. Barons: Delaware, Cobham, Grey of Wilton. Knights: Sir Fras. Bryan, Sir Thos. Semer, Sir Wm. Sydney. Lord Russell:—Princes: as Wingfield. Barons: Par of Horton, Cobham, Delaware. Knights: Strangwais, Semer, Sydney. No election followed. I am unclear if anyone was nominated. This wonderful research does not show anyone added in 1546 – click here. The feast of St. George appointed to be kept at Windsor, 6 June, by Lord Russell assisted by Cheyney, Wingfield and St. Leger: which was done in due course. So they had a feast but it does not appear that anyone was actually inducted. In 1547, under the reign of his nephew, King Edward VI, Thomas Seymour was the 320th person to be inducted into the Knight of the Garter. I have been unable to discover who nominated him but would like to believe it was either his brother or the King. Here is evidence that he was indeed inducted: Click Here It has also been mentioned in several articles by reputable sites online including the List of Knights and Ladies of the Garter. It was only 23 months later that Thomas Seymour would be executed for treason and open a vacancy for another member to be inducted. This is the first time I really noticed that the Garter symbol ends in a belt which could certainly be interpreted as phallic. Which begs the question, other than Queens Regnant, have there ever been any females ( or dames) of the garter? Thank you for following up so promptly. The list made interesting reading, and although there are several ladies on the list, they were spouses of kings of England, or close relatives, such as the Princess Royal. There is only one woman on the list who is neither queen or royalty, and that is the Duchess of Norfolk. Good to see that the ladies are represented. I am American, and I love English history and genealogy.